The town of Biysk is also aiming to host the Siberian Pelmeni Games. A city in southern Siberia is planning to establish its own competition for producing pelmeni, the renowned Russian dumplings, and will also hold its own Siberian Pelmeni Games. The unusual initiative has been proposed by officials in the town of Biysk, located in the Altai Territory, 1,900 miles east of Moscow, population 204,000 inhabitants. The Biysky Rabochy newspaper cites director of strategic development and economy at the Biysk municipal administration Zinaida Tikhonova as saying that the town is planning to establish a federation for the competitive production of pelmeni, as well as hold the Siberian Pelmeni Games. The idea for creating the federation came as a result of the development of event tourism in the territory, Biysk in particular. The first sporting pelmeni production championship took place in April 2014. The teams competed in the categories of The Fastest Hundred, The Jeweler’s Precision and The Pelmeni Relay Race. The event's guest of honor was the presenter of the Russian culinary TV show "Let's Go and Eat!," British national John Warren. 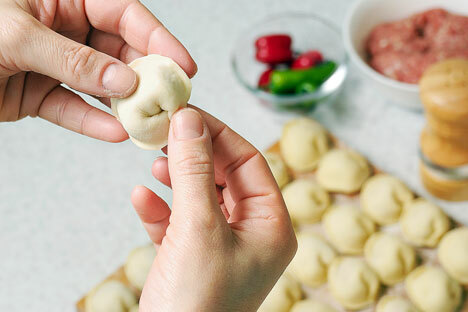 According to Zinaida Tikhonova, the federation for the competitive production of pelmeni will become the main conductive structure for a new culinary type of sport.